During her confirmation hearing on Tuesday, Gov. Ned Lamont’s new budget chief, Melissa McCaw, said the governor has not finalized his position regarding electronic tolls on Connecticut’s highways. “So, tolls on all vehicles are on the table right now?” Perillo asked. “A decision has not been made on tolls,” McCaw replied. That may come as a surprise to many in the state. Throughout his gubernatorial campaign, Lamont said he only supported tolling large trucks — a practice which faces a legal challenge in Rhode Island. However, Democratic Party leaders who now control both the House and Senate in Connecticut are pushing for tolls for both trucks and passenger vehicles. Earlier in the year, Sen. Alexandra Bergstein, D-Greenwich, proposed a bill authorizing the Connecticut Department of Transportation to establish electronic tolls on highways. Although the bill is only in concept form at this point, it made no distinctions on what types of vehicles would be tolled. Democrats have also renewed a push to establish a “transportation authority” similar to New York’s Metropolitan Transportation Authority, which would then have the ability to set tolls rates and locations throughout the state. Both proposals echo the recommendations put forward by Lamont’s Transportation Advisory Committee in December. said his organization opposes tolls on any vehicles, but that the governor made his position clear during his 2018 campaign. The plan to emulate other state transportation authorities such as the Metropolitan Transportation Authority may not be as efficient as some lawmakers hope. The MTA faces significant debt — $38 billion — and the costs for labor and debt service are being met with higher train fares and calls for new taxes. New York Gov. Andrew Cuomo proposed a new fee on motorists entering Manhattan, and New York City Mayor Bill DeBlasio has proposed a new tax on residents earning over $500,000 per year to boost MTA funding. 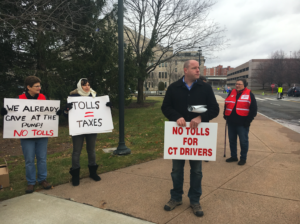 Although tolls were listed as one of Democrats’ top five legislative agenda items, it remains possible that Lamont or legislative leaders may punt on the issue this year. As lawmakers deal with a projected $3.5 billion budget deficit, the state’s Special Transportation Fund is actually a bright spot in an otherwise dreary budget year. The Office of Policy and Management and the State Comptroller’s Office project the STF will have a surplus of $315 million by the end of fiscal year 2019, and consensus revenue estimates from Office of Fiscal Analysis and OPM project STF funding to increase by $310 million by 2022. While this could bode well for Connecticut’s transportation funding, it may also prove a temptation to lawmakers facing a budget deficit. Large portions of transportation revenue to the STF are protected with the state’s new “transportation lock box” but sales tax revenue scheduled for deposit to the STF is not, and lawmakers can withhold those funds to help fill budget gaps.